PHOTO BY JILL GOSCHE Santa Claus helped deliver gifts to families in the Sycamore area Monday. 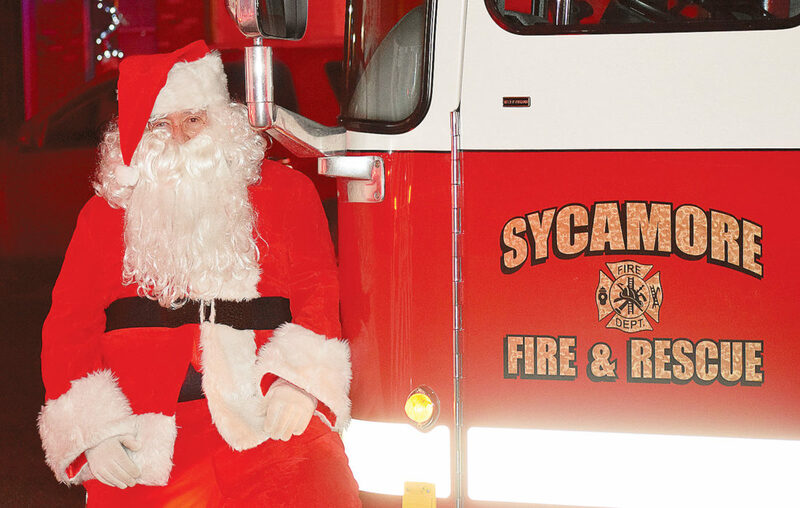 SYCAMORE — Santa Claus gave up his sleigh for a fire truck Monday. Instead of reindeer, he had a crew from Sycamore Volunteer Fire and Rescue to help him make deliveries. Santa and the crew delivered gifts to homes around the Sycamore area. Chief Rodney Clinger said the effort was funded by Sycamore Volunteer Fire and Rescue Inc. and included some donations in the community. This year, four families received gifts. It’s fun to do, Clinger said. “We do this in lieu of our meeting night,” he said. The annual event started when someone donated a wagon full of toys back after winning it at bingo. “We donated that to our first one family,” said Pamela Hoffert, bookkeeper for Sycamore Volunteer Fire and Rescue Inc. This year, T-N-T Pizza donated a jumbo pizza for each family and the crew took the food with a beverage to the families. Firefighters’ families purchase gifts, and others wrap them for Santa’s big trip. “It’s a whole family thing,” Hoffert said. The whole community gives to the crew, she said. “This is one way that we can help support our community back,” she said.